Newcomer Family Obituaries - Ferman Lavon 'Von' Wells 1944 - 2019 - Newcomer Cremations, Funerals & Receptions. Ferman Lavon Wells "Von", age 74 of Huber Heights, passed away February 6, 2019. He was born November 3, 1944 in Luxora, AR and raised in Mobile, AL to the late Floyd Wells and Cora (Steward) Mosley. In addition to his parents, Von was preceded in death by his father and mother-in-law, Anthony and Dorothy Reger; brothers-in-law, Charles Thurman and Donald Higgins and sister-in-law, Pat Reger. He is survived by his loving wife of 50 years, Kathleen "Kitty" (Reger) Wells; children, Dean (Teresa) Wells and Ian (Beth) Wells; grandchildren, Matt, Katie, Max, Kendall, Autumn, Gracie and Eli; sisters, Melba Higgins and Lana Thurman; brothers-in-law, Jim (Babe), Jack and Mike (Anne) Reger; numerous nieces, nephews, extended family and friends. Von worked and retired from General Motors after over 30 years of service. 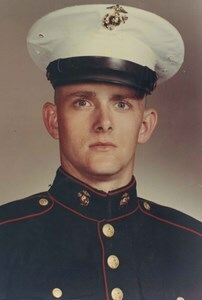 He proudly served in the U.S. Marine Corp having been stationed in Cuba in the 1960's before doing a tour in Vietnam. Von was member of the V.F.W. Post 6560 and American Legion. He was an avid Alabama Crimson Tide fan. Roll Tide! A gathering of family and friends will be held from 11:30 AM to 1:30 PM on Monday, February 25, 2019 at Newcomer North Chapel, 4104 Needmore Rd. A funeral procession will leave at 1:30 PM for Dayton National Cemetery where military honors will be performed by the U.S. Marine Honor Guard at 2:30 PM. In lieu of flowers, please make donations to Marine Corp Association (Toys for Tots), American Heart Association, American Lung Association or Diabetes Association, in Von's memory. To share a memory of Von or leave a special message for his family, please click on the Share Memories button above. Add your memories to the guest book of Ferman Wells. Even though I did not see you I always knew you were there. You will always be my baby brother. I was suppose to go first not you. you were probably the only person in my life who loved me unconditionally. Rest in Peace. you have an awesome family and I know they will miss you everyday as I .